Google will announce at its I/O developers conference on Wednesday a completely redesigned AdMob advertising platform and advancements to its digital payment service aimed at helping developers accelerate their ability to build in-app experiences for customers. During the keynote, Sridhar Ramaswamy, svp of ads and commerce at Google, will discuss the redesign of the platform for mobile and desktop. Developers will have the ability to pick an app to monitor, review the key metrics and then quickly take action to fine-tune its performance. Google has also integrated Google Analytics for Firebase into the core of the redesigned AdMob so marketers will have quick access to metrics. 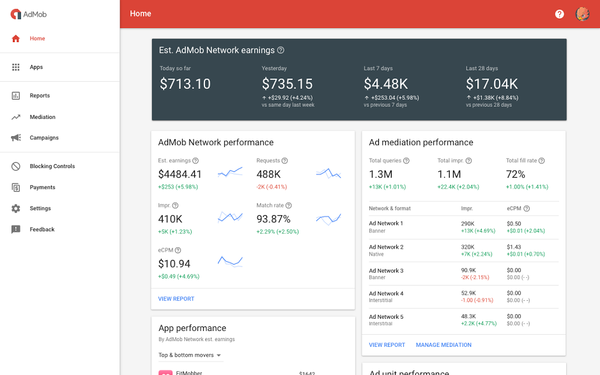 Linking the AdMob and Firebase accounts will give users access to detailed ad revenue data and user insights such as time spent in the app and in-app purchases. AdMob has paid developers more than $3.5 billion dollars in ad revenue for the more than 1 million apps across iOS and Android. The new AdMob was built based on what Google calls Material Design, a new suite of tools and open-source projects aimed at helping to make product design easier. For developers, ads through AdMob are one way to monetize their apps, and in-app purchases are another. Google also will announce several payment options during the keynote. For starters, users will have multiple Google payment options, like a credit or a debit card previously saved via Android Pay, a payment card used to transact on the PlayStore or a form of payment stored via Chrome. They will be able to use these saved payment options in third-party apps and mobile sites, as well as on Google Assistant. The Google Payment API will enable merchants and developers to speed checkout conversion by offering users an easy way to pay with credit and debit cards saved to their Google Account. In the blog post, Ramaswamy called the API a "significant innovation" that can enable faster checkout, more conversions, and reduce abandoned carts. Ramaswamy will also introduce App Attribution Partner, a new measurement program that allows developers who rely on third-party measurement providers to measure the impact of ads and gain valuable insights about how users engage with your app. The launch partners are adjust, Adways, AppsFlyer, Apsalar, CyberZ, Kochava and TUNE.